We’re back with the latest daily round up of coin collecting news and articles from around the internet! 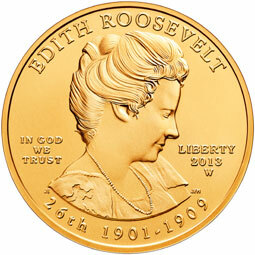 The United States Mint has opened orders for the 2013 Edith Roosevelt First Spouse Gold Coins. This comes just seven days after the last release of the series. According to Dave Harper, next year’s 2014 Baseball Hall of Fame Commemorative Coins will be made to order in a fashion to how recent special American Silver Eagle sets have been offered. Coverage from the Washington Post on the ceremony held to award Congressional Gold Medals to Native American tribes with Code Talkers. This article has a few photos from the ceremony and a compilation of images and descriptions for the 26 medals released so far. A Numismaster article focused on collecting Barber Quarters. Jeff Garrett gives some advice on selling rare coins at auction. Doug Winter shares a letter from a reader with his experience with the Eric Newman sale. An article in CoinWorld discusses the question of rarity for the new $100 FRNs. PCGS will host the first East Coast public display of the current top ranked Morgan Dollar Set. The Royal Mint Blog discusses the impact of the First World War on Britain’s gold sovereign. Here is another separate article concerning the history of the sovereign. World Mint News Blog showcases ten impressive coins which did not win a Coin of the Year Award. And now for today’s notable auction. A group of 40 different PCGS & NGC graded modern coins across a variety of denominations with most coins graded PF 69 Ultra Cameo. That’s it for the update. See you tomorrow!